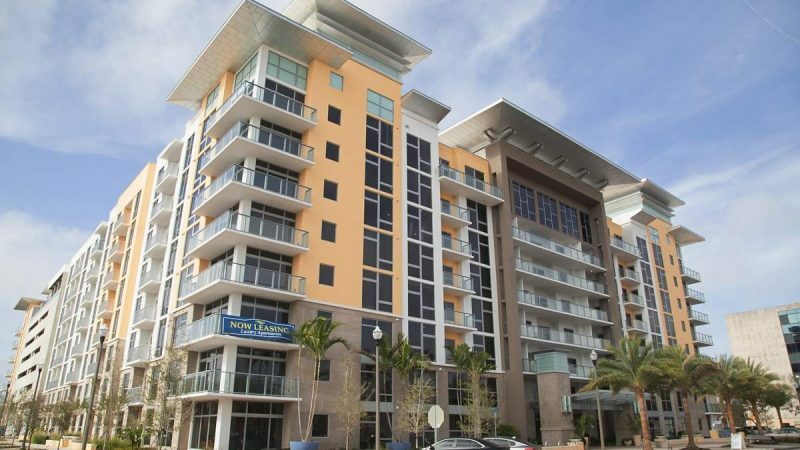 The Hermitage apartments in downtown St. Petersburg have sold for $107.6 million, a near record price per unit for a rental project in the Tampa Bay area. The eight-story, two-year-old building at +just east of the city’s thriving Edge District was purchased by Dedicated Hermitage LP, which has a Toronto, Canada, address. The Hermitage’s new owners paid $309,267 per unit, second only to the $354,000 per unit for the the 17-story Camden Pier District tower on Third Street S several blocks closer to the city’s waterfront. Camden Pier, originally called AER, sold for a record $127 million exactly a year ago. Both it and the Hermitage are just a few hundred feet from a Publix supermarket and within easy walking distance of dozens of restaurants and stores. Downtown St. Petersburg and the Edge District have been in the midst of an apartment boom since the Great Recession. A Miami company plans a 23-story, 218-unit tower on Fourth Street S directly across from the just-completed 326-unit Avanti apartments. Along 16th Street N in the Edge District, two more apartment projects are under constructions with a planned total of nearly 500 units. Although more than 2,000 new apartments already have been built in and around downtown St. Petersburg, Kattan thinks the market can handle more. All of the projects are billed as “luxury,” with rents to match. Rents in the Hermitage, which has studio, one- and two-bedroom apartments, range from about $1,500 to more than $3,600 a month. Kattan acknowledged a lack of affordable housing and said apartment developers building luxury units might feel “some short term pain” if rents continue to rise faster than wage increases. “Long term, though, it will all get absorbed and the pipeline for the next few years is actually short of anticipated absorption,” he said.